Now, I know I am not an ad executive type. My clothes aren’t classy enough, and I don’t drive a Porsche. Yet as a member of the great unwashed I still have a few ideas about how an ad should work. Firstly that ad should sell something, say a product or a service, then it should make me want to get that service as soon as possible. Certainly before I change my mind. Why yes, I’d love an ice-cream. And what I can use EFTPOS for it. Why all of a sudden EFTPOS felt the need for expensive TV ads and this huge placement in Flinders St Station I will never know. Perhaps NFC is coming soon, who knows, but I digress from my need for an ice-cream. 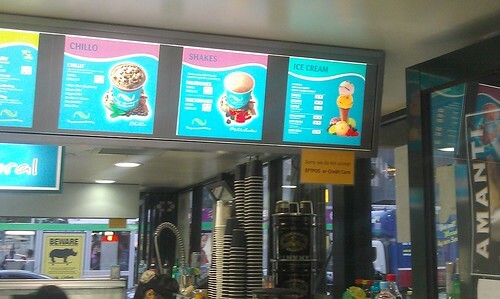 Low and behold, just below that giant ice-cream, the one that I can purchase on EFTPOS is an ice-cream shop. Perfect….. well it would be…. See that little yellow sign. Small problem with that sign… yes, they don’t have EFTPOS. Seriously who placed those ads in that location. Why didn’t they either A: not put the ice-cream banner next to the ice-cream shop, or B: give the shop EFTPOS for the duration of the campaign. Even better, they could have let two other shops, the two out of five there that actually have EFTPOS have a limit below $5 per transaction. Why, because then I could have brought the cup of coffee that is in one of the other banners that is less than $5. The one the ad says I can buy on EFTPOS, the one I can’t. But then, what do I know. 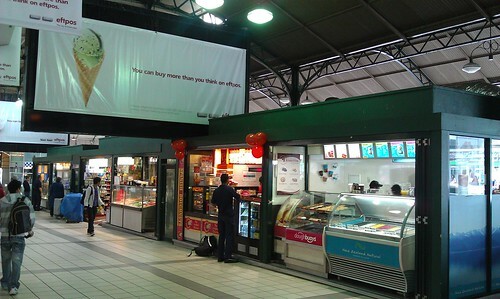 P.S Dear staff at Flinders St Station, why do you get so upset with people taking photos all the time.